The peak is slightly east of the main Raglan Range. Scott Stream is the easiest access. Scott Stream is the easiest access. From Greigs Hut cross the Branch, following a track into the stream. Good campsites in a basin at 1200m. In winter, ice forms in runnels and on buttresses above the campsite. From the basin climb easy, scrubby slopes on the true left of the stream into tussock basins and scree below the peak. Ascend easy slopes to a notch just south-west of the summit. The gully in the centre of the face leads to a steep traverse to the left, and is a good winter ice climb. Climb scree slopes east of the peak to the ridge. 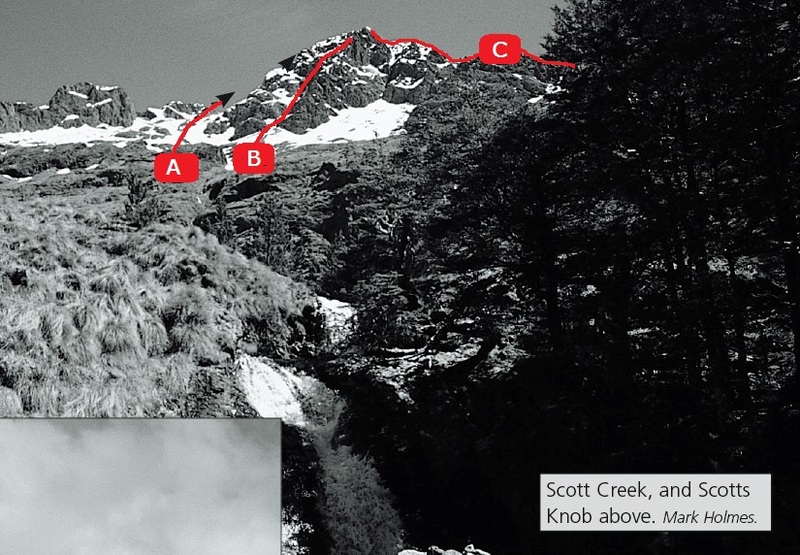 Follow the ridge till a ledge allows bluffs and gendarmes to be turned by traversing slopes on the Silverstream side to regain the upper ridge. . Can also be done from the Silverstream-Branch River confluence.